Considering the meteoric rise of street artist Banksy, going from just one of many similar artists to someone whose work routinely sells for thousands of pounds and who can be called upon to design a typically bleak and hilarious opening sequence for The Simpsons, his first foray into film seems both inevitable yet unexpected. There is a limit to what his satirical pieces can do, so a move into a more populist medium makes sense, but that just raises the question of whether or not his impish satire would work on film. Exit Through The Gift Shop, whilst not as dark as Banksy's other work, definitely maintains the healthy irreverence which has gained him such notoriety. The film is, at least initially, about Thierry Guetta, a French man living in Los Angeles with his family, who he supports by running a vintage clothing shop. Guetta recounts, with a little help from narrator Rhys Ifans, how he became involved with the street art movement when he discovered that his cousin was Invader, an artist of some renown in France. Guetta becomes obsessed with the mechanics of street art, the way in which the artists risk arrest and their lives in order to express themselves, and starts to hang out with artists all over the world. Though he starts as a mere observer who films them going about their work, he eventually starts to help and becomes more involved with scene. It's through this gradual introduction to that world that he learns of the existence of Banksy, whose worldwide renown and complete anonymity compel Guetta to seek him out, something he does with relative ease. The two begin to spend some time together. Banksy shows Guetta how he goes about planning his stunts, and shows him some of his old material, the most interesting of which being a collection of £10 notes on which he had substituted Princess Diana's face for the Queen's. In one of the film's funniest moments, Banksy recounts how he had to quickly withdraw the notes when he realised that people were spending them, inadvertently turning him from satirist to counterfeiter. The first half of the film is fairly entertaining and it offers both an interesting look at the lives of street artists danger involved in their work, which is depicted in an exhilarating fashion, as well as the life of Thierry Guetta himself, who is presented as an enthusiastic, if obsessive, fan who just wants to get close to Banksy. It's this aspect of Guetta which turns the film on its head, and transforms it into either a documentary that also serves as a piercing satire on the emptiness of the art world, or an elaborate prank designed to highlight the emptiness of the art world. Having filmed thousands of hours of footage, Guetta decides to make a documentary about street art which he believes will be the definitive account of the movement. 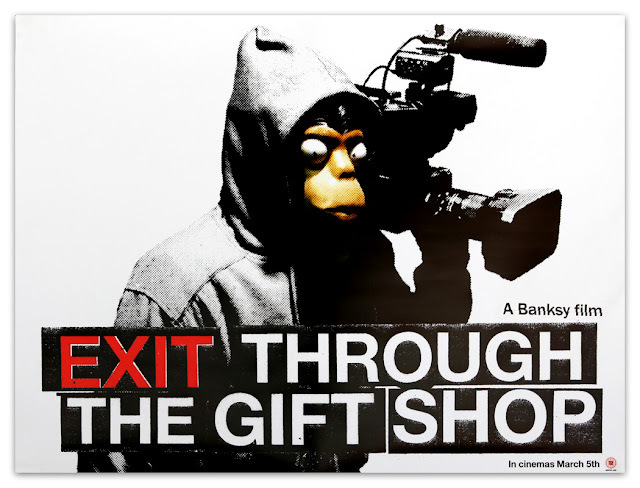 When he eventually shows the documentary to Banksy, and, by extension, the audience, it's an unholy mess of colour filters, nonsensical editing and abrasive music that could be considered an avant garde piece of art in itself, but wholly fails to depict the form which he claims to love so much. Banksy confiscates the tapes, presumably to make the film we are watching, and Guetta returns to L.A.
Once there, Guetta decides to strike out on his own and become a street artist. Despite his work consisting of nothing but images from pop culture haphazardly thrown together - essentially Banksy without the wit - he begins to generate buzz and decides to stage his own show. The film then becomes an uproarious farce in which Guetta, an obvious charlatan with no idea what he is doing, attempts to stage a huge showcase for his work when he hasn't even produced the work that will be showcased. As the day of the show gets closer, we see the strain being put on all the people helping to stage the show, and the way in which they contrast with the irrepressible Guetta, who can't stop hyping up a show that doesn't even exist. Knowing Banksy's work, and knowing that he has spent much of his career casting himself as the Jester of modern society, the question of the film's authenticity comes into question very early on, and particularly once Guetta begins his own artistic journey and when we consider just how closely his work resembles Banksy's. Since Guetta did actually put on a show in L.A. and the works shown do exist, the idea that they staged it as a hoax seems implausible, but not impossible, and the idea is appealing because it fits in with the preconceived notions most people have about Banksy. It's that aspect of the film which makes me think that it probably was real, since nothing would be a greater twist than discovering that there is no twist, but the veracity of the film only matters in as much as it gets people talking about the film, and it isn't the reason why the film exists. Real or not, the film would still make the same point; that art is only as valuable as people think it is, and that any artform, no matter how edgy or underground it is to begin with, loses its power to shock as soon as it is co-opted by so-called "experts," and therefore loses its reason for being. Like much of Banksy's work, it makes a serious point in a refreshingly glib way, and the resulting film is as fun and exhilarating as any fictional film this year. Unless it is all fake, in which case its as thoughtful and intelligent as any documentary this year.